HIS club is gripped with All-Ireland fever but Two Mile House veteran Derren Casey remembers a time when the ambition within the club was to win one game. “I remember one year we hadn’t won a championship game for three or four years and the aim was to win a championship game, never mind get to a final or top our group. I’ve been on the panel since I was 16, since 95 or 96 maybe. 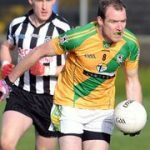 We didn’t win anything until we won Division 3 in 2008 and then this year when you are nearly on your last legs you win everything, it’s great,” said the 34-year-old. Casey can laugh now but there were some dark days, particularly last gasp county final defeats to Straffan in 2009 and Clogherinkoe in 2012. Casey managed the likes of Chris Healy, Mark Sherry, Adam Burke and Chris Julian for two years at under-16 level and a year at minor. The fact that a lot of these young players operate in the forward line has been an even bigger bonus. “For years we basically had one forward, Aidan Casey. Aidan is still only 25 or 26 but he was in the forward line on his own for years. Now we could start six minor or under-21 players in the forward line in an All-Ireland final and we’d have no problem with it. It took the pressure off Aidan. They went straight into the team and it makes the job of everybody on the team that much easier because we just win back the ball, give it to them and they do the damage,” says Casey. Even with those players coming through, Two Mile House needed a man to harness their talents and Jarlath Gilroy has been the perfect manager for the club. “My dad was chairman at the time when the club was looking for a manager and I had a bit of inside info that he was interviewing Jarlath and I couldn’t believe that somebody like him could be getting involved with our team. I had seen what he did with Ballymore and he was with Kildare underage teams. His name came forward and I was thinking this is nice. He’s a winner and we had the underage players coming through at the same time. All the elements of a good manager, talented young players and relationships between team mates culminated in one perfect moment in the Leinster final against Hunterstown Rovers. With 15 minutes left, the game was on a knife edge. Aidan Casey lined up for a shot and Derren was alert to every possibility. That goal was a pivotal moment in the game and led to an All-Ireland semi-final against Emyvale of Monaghan where that wonderful injury-time point from Casey’s midfield partner Niall Browne settled the game. “Niall was just a man possessed during that game. When he had that last ball I knew he would score because he had hit four already. On another day he might have dropped that short but he would have done the same three or four times already in the game. I knew that he was going to score. I thought it was a draw game at that stage and my first thoughts when he scored were how am I going to last another 20 minutes but then the final whistle blew and we won and it was amazing,” he said. His father, Paddy, and his wife Carol, whose brother Ben Merrins is also part of the squad, are completely engrained in the club and that means those special moments along the way to Croke Park have held even greater significance for the Casey family. “I saw my wife jumping the fence with the two kids hanging out of her in Pearse Park. I saw my Dad, it was just crazy. I was wrecked after, it was emotionally draining but it was a great feeling,” he said. He hopes to enjoy a similar feeling on Sunday. The day after, he flies to New Zealand ahead of his brother’s wedding the following weekend. It would cap an amazing 12 months if he could make that trip as an All-Ireland winner.